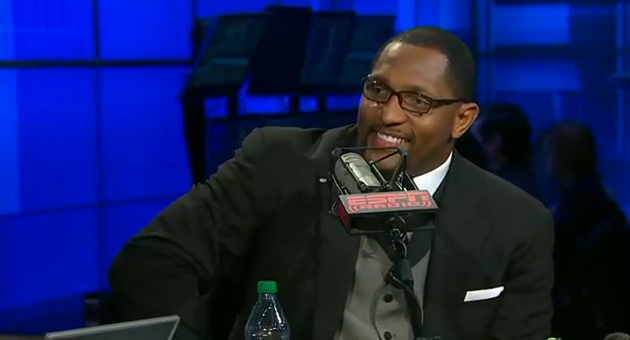 Trevor Pryce says former teammate Ray Lewis' leadership comments were "self-serving"
Trevor Pryce and Ray Lewis were teammates on the Baltimore Ravens from 2006-2010. Now, both are working in television, though with different networks – Lewis with ESPN and Pryce with Fox's Crowd Goes Wild. Earlier this week on Monday Night Countdown, Lewis questioned the lack of leadership in the Ravens' locker room following his retirement. Pryce, who has been one of the standouts of Fox Sports 1 during its first month plus on air, didn't agree with his former teammate in comments given to the Baltimore Sun. "Here's the thing about the Ray Lewis leadership thing, when you start telling the media that things would be fixed if you were there, that can be a little self-serving," said Pryce, a four-time Pro Bowl selection who now works for Fox Sports 1 on the "Crowd Goes Wild" show with Regis Philbin. "Once you read the narrative about yourself, that's the narrative you're going to stick with. God bless him, but they asked Ray that question knowing exactly what the answer will be. Me personally, Trevor Pryce, I've been to many a player function where things got a little bit out of hand, but nobody went running to the media. I've seen things happen at player functions that were crazy and I'll say, 'How could this have been avoided?' Well, the only way to avoid is to not have a party at all. It was a party, and it went wrong." Pryce continued with his comments, elaborating on why the party bus situation didn't occur because of a lack of leadership. "That's not a question of leadership. That's what is making the current Ravens upset about it is because they're saying, 'We were going to have this party regardless if Ray was here or not.' That's the disconnect between what's real and what leadership is what a leadership would do. Bryant had a party, got a bus, went to D.C, which is a safe city for the most part. It's responsible of them to get a party bus and not drink and drive. How could the incident have been avoided? Don't get on the bus and have that party, but that's not realistic. These are grown men who are going to try to unwind and have a good time on their night off, but you try to do it responsibly. To me, this doesn't show any leadership issue. It's just one thing that happened and people found out about it, but it doesn't mean the Ravens are all of a sudden out of control with Ray Lewis gone. Know what I'm saying?" The backlash towards Lewis in Baltimore isn't just limited to former teammates, as Sun columnist Mike Preston took Lewis to task for his leadership comments, agreeing with Pryce's opinion that they were self-serving. All it took was one month of Lewis working full-time at ESPN for him to stir up controversy in Baltimore and among his fellow media members. Who knows, maybe Bart Scott (who works for CBS Sports Network's That Other Pregame Show) will chime in and further throw him under the bus.